This BLOG-like page is being generated in a form similar to previous ETS ones to document and provide information on a Northern Washington ETS that started in Dec 2015 and seems to be progressing, with a pause into southern Washington. There are no special experiments in the field for this ETS. Feb 1, 2016 - This post is being started VERY late as compared to other tremor blogs. What with the web page being changed, other things going on, not sure what was happening here and other pathetic excuses (blogger is a flake) it is finally being updated to provide a bit of information about this, now ongoing, event. The following few paragraphs are to catch up with what has been observed thus far. There have been many post on the PNSN twitter feed and two "Observation" posts on "A perspective on Tremor activity" by Aaron Wech and a more general description of "Slow Earthquake Trembles beneath Vancouver Island" by Shelley Chester. Dec 22, 2015 - The official start of this ETS was not recognized at first and may, in fact, not be the real start since there was brief activity in souther Vancouver Island (VI) on Dec 19 and then a burst of activity in northern VI on Dec 21. But from Dec 22 on there seems to be relatively connected batches of tremor that spreads out from the souther VI location with some jumping around over the next few days. It first moves up-dip over a couple of days and then splits into a group that stays just west of Victoria and another group that moves and jumps to the north-west. By Dec 29 it has mostly filled in the zone between Victoria and Gold River in central VI. Dec 30, 2015 - The tremor finally goes international and starts to cross the straights into Washington. 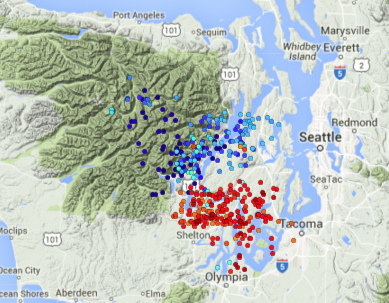 The northern batch of tremor dies out the next day and the tremor moves into the Olympic Peninsula. 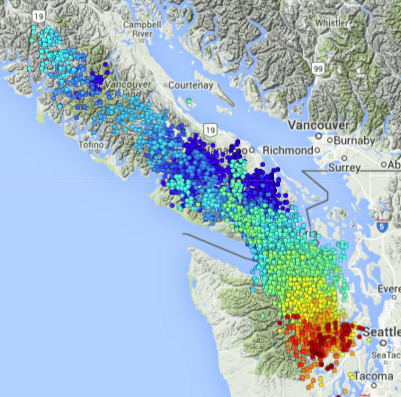 Jan 16, 2016 - Tremor died out in Canada on Jan 5 but continues migrating south in Washington as a fairly compact batch. As it reach the latitude of Seattle it seems to be weakening with fewer located events than is normal for tremor in this area during previous ETSs. There is even a pause of no located events on Jan 13. A few more bursts on Jan 14 and 15 and a final dribble on Jan 16, 2016 ends what seems to be a standard Vancouver Island-Northern Washington, 14 month ETS event. Jan 20, 2016 - After almost four days with no tremor locations things start happening again distinctly to the south of where it had previously died out. With minor pauses vigorous tremor goes for several days at the south end of Hood Canal and then slowly starts progressing to the south. 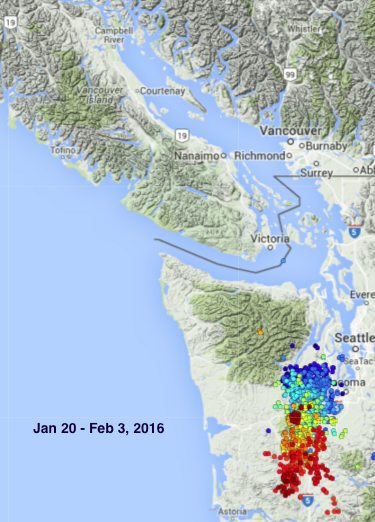 By Jan 27, 2016 it is concentrated near Olympia. By the end of the month it seems to be clearly on the move heading south. Here is a map, color coded by time (oldest in blue, newest in red) of the tremor locations from Dec 22 - Jan 16, 2016. This covers an area that is typical of many of the ETS with the ~14 month interval and the one that is the best studied in all of Cascadia. Following this ETS it looks as if another is starting that may extend down into at least central Oregon. To illustrate how these probably are really two separate ETS, not only was there a gap of almost four days between them but as you can see in the following figure, in which tremor locations from the last few days of the regular ETS (blue) are seen to be almost totally separate from the first few days (red) of the following batch of tremor. Time will tell if this onward march of tremor locations will really fill in the much more rare Oregon ETS. Feb 1, 2016 - We now seem to be a week into this next phase of an ETS.... or a separate ETS that may continue on into central Oregon. As of today the southern Washington tremor activity has progressed most of the way to the Oregon border. The following figure shows a map of the first two weeks (Jan 20 - Feb 3) of this next period. It is plotted at the same scale as the comparative weekly maps of tremor for the past 9 major ETS events. If things go as we (I) think they will this will continue south over the next few weeks to fill in the area in north and central Oregon that has not had a major ETS in several years. Of course it may just jump south rather than move slowly south. 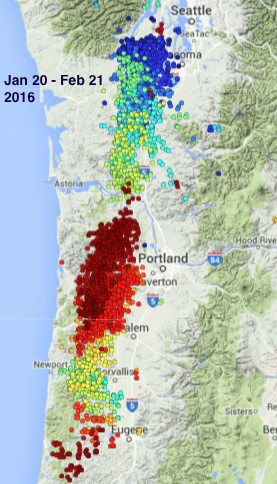 There is a hint of that today where a fairly intense batch of tremor is located near Corvallis, OR. Stay tuned. Feb 10, 2016- Well look at that. No sooner had I "predicted" that this tremor would move slowly south it has indeed jumped and seems to be picking up steam in central Oregon. As mentioned in the "Observations" post about back-to-back ETS this type of action has taken place in the past. During the past week there have been as many tremor locations found in central Oregon as have been found in northern Oregon-southern Washington. In fact for the past couple of days the tremor in the northern batch has died out. 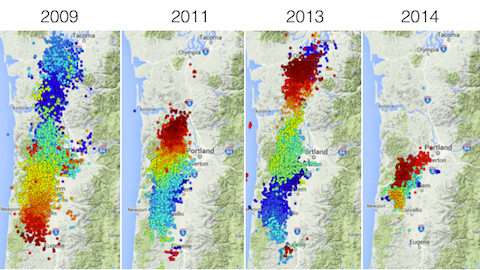 Here is a map color coded by time (oldest-blue, latest-red) of the tremor locations since Jan. 20, 2016, when the projected Oregon ETS started. Note that there are no dark red tremor locations in Washington. Now we will see if the central Oregon batch will move north filling in the zone around Portland. 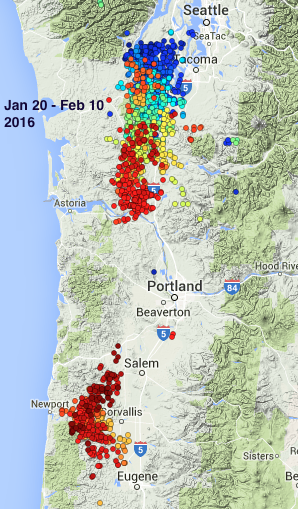 Feb 22, 2016 - It looks as if the Oregon tremor is now almost to fill in all the missing parts. The following figure is a continuation of the above one, but going through Feb 21, again color coded by time. Note that the most recent tremor (dark red) now extends to the northwest of Portland and is starting to overlap the southern end of the first part of this sequence (light green) that died out about Feb 6-7, a few days after the central Oregon patch started up. That patch has spread from the area just west of Corvallis (green) mostly to the north with strong tremor being concentrated between Salem and Portland for several days (orange) and is now west and north of Portland (red). There also seems to be a weaker patch going at the south end of this zone just west of Eugene (orange-red). It seems this activity is almost to fill in the standard Oregon ETS zone that historically has a major ETS only about every two years. My feeling is that it will die out within the next couple of days and then this zone will remain mostly quiet for another two years. 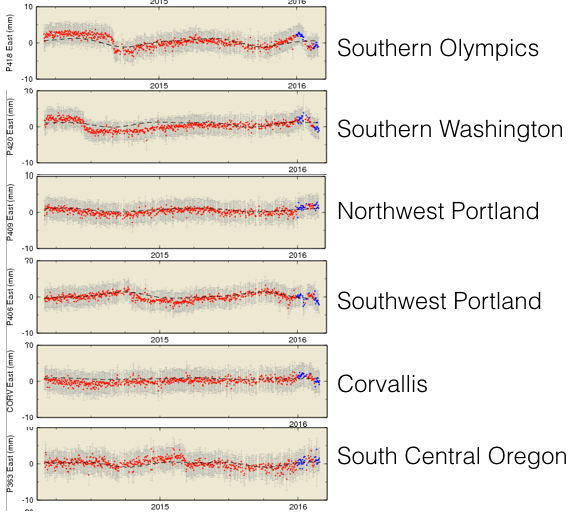 Plots of the past four major Oregon ETS events indicates that it usually extends from about Tacoma in the north to about Eugene in the south. It is pretty much at this extent now and thus should be dying down soon. As in the past there is no indication that this ETS activity is any different than what has taken place in the past and has no known significance relative to a large damaging type earthquake. March 4, 2016 - IT'S OVER! The last tremor of the Oregon ETS was on March 1 and thus after a couple of days with no more tremor I declare this one is over. It finished up just about as we thought it would though it took a few extra days to wind down. Below is a tremor map, again color coded by time. As can be seen the ETS ended up with its final week or so northwest and west of Portland. It covers very much the same area as previous one; so nothing out of the ordinary they the duration (~40 days) was a bit on the long side. The other plot is a density plot showing contours for how much tremor over the corse of the whole period took place in different areas. 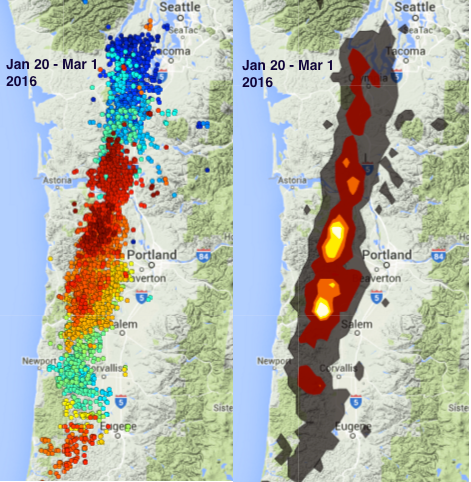 The maximum activity was was and southwest of Portland in areas that have likewise been very active in previous ETS events.